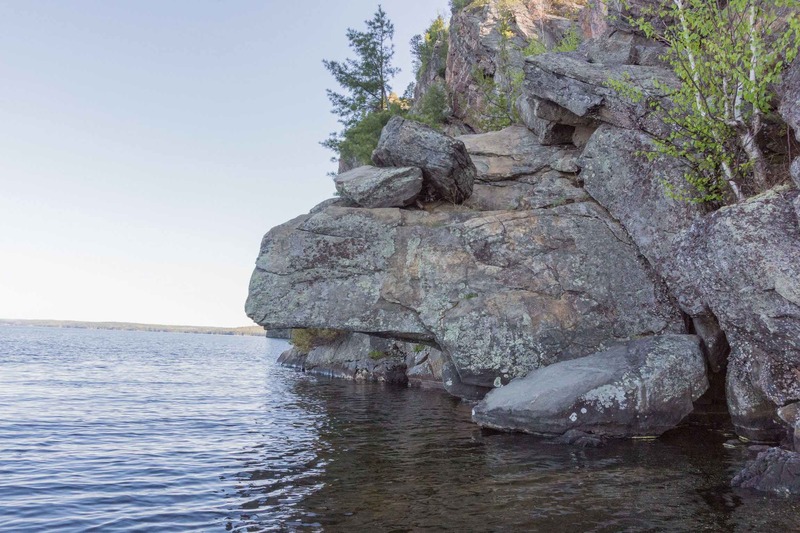 Massanog, Massinaw, Mazinaw …no matter how you spell it in English, the roots of the word lie in the Algonquian language of those who came to this lake over a time span measured in millennia. 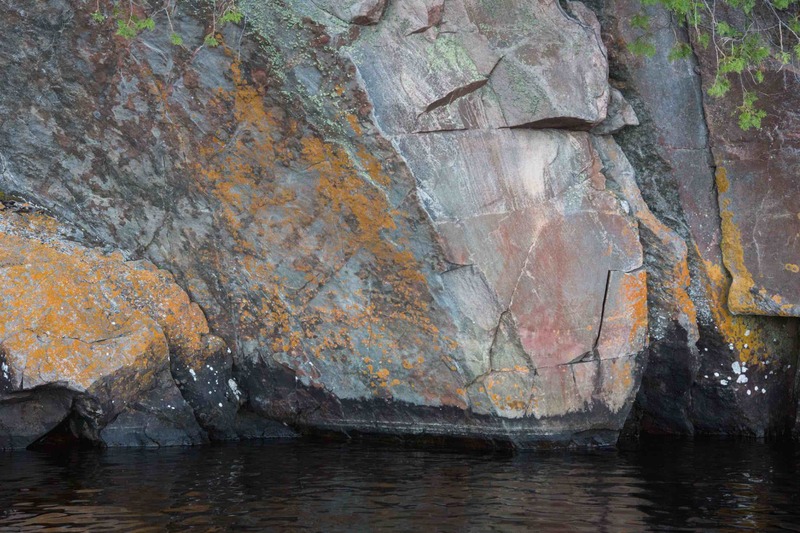 Meaning something like “painted image”, the lake gets its name from the close to three hundred ochre rock paintings put there by Ojibwe or other Algonquian-speaking people three or four hundred years ago or perhaps even longer. Their canvas? 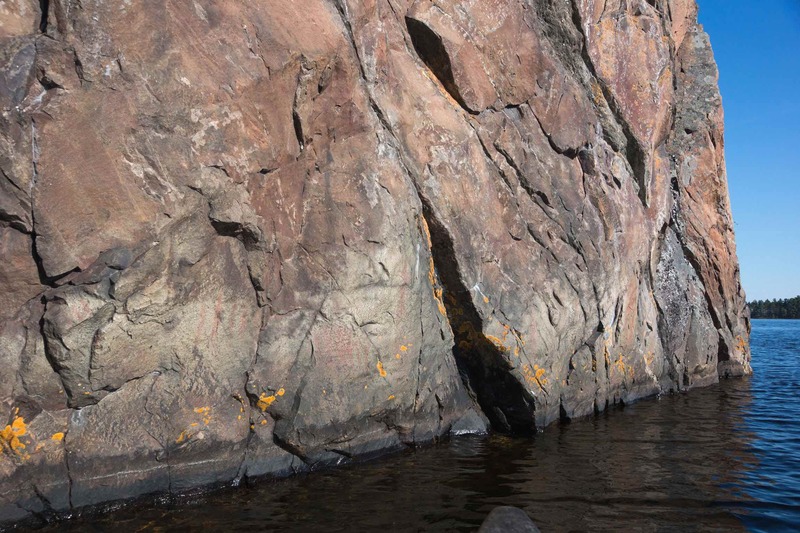 Three kilometers of awe-inducing vertical pink granite cliff face with heights of up to one hundred meters. 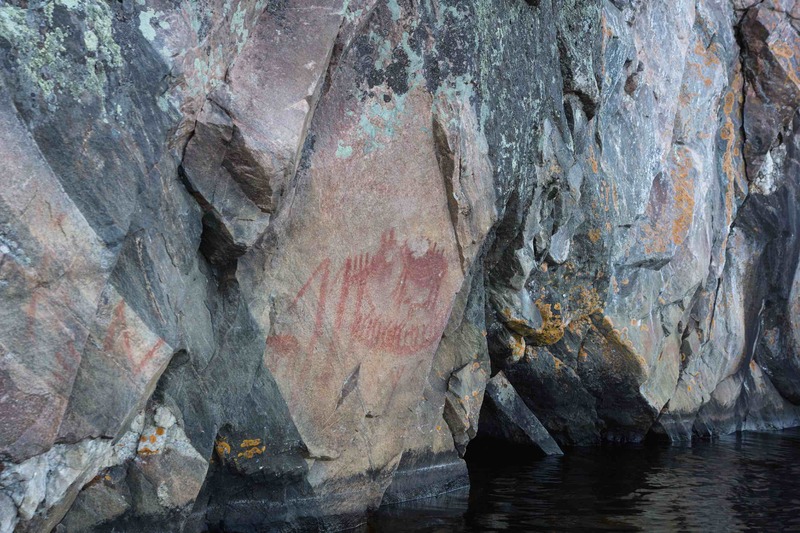 Mazinaw Rock has the largest single collection of pictographs in the entire Canadian Shield area. My brother and I have visited a few of these rock painting sites over the past three years, often taken in by the majestic settings in which the shamans and vision quest-ers of old chose to make their ochre marks. 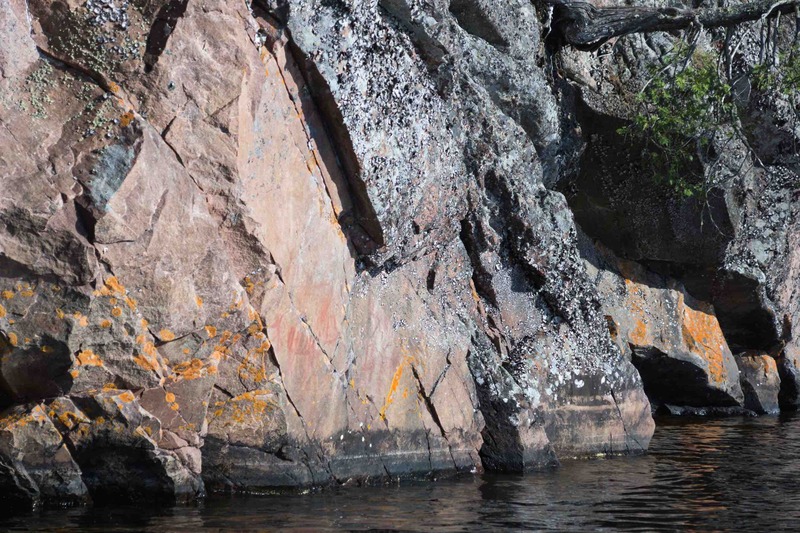 Agawa Rock on Lake Superior, the Pikitigushi River’s Cliff Lake, the Bloodvein’s Artery Lake … one hushed “wow” after another as we came up to them. 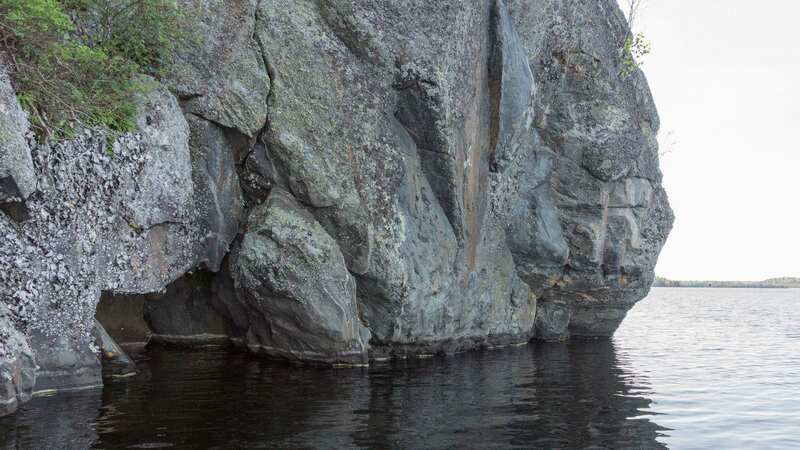 Now we were looking at the Mazinaw Rock about five hundred meters across the lake, ready for the biggest wow of all. 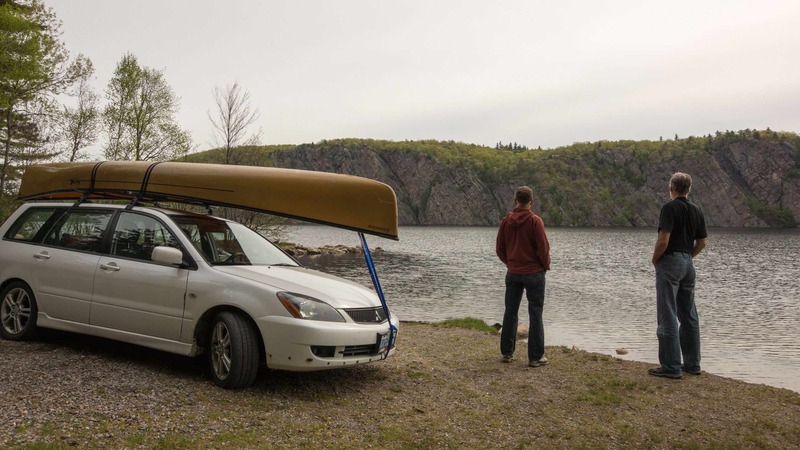 Bon Echo Campsites =- a small town when everybody’s there! 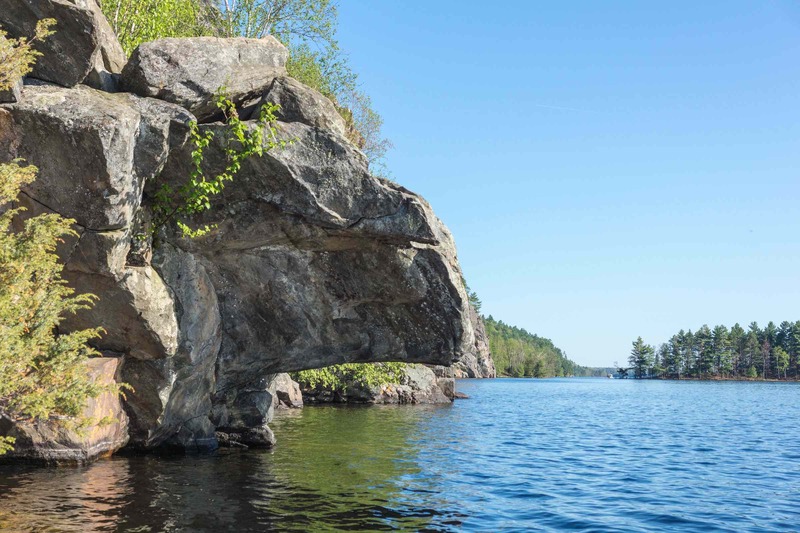 We visited Mazinaw Rock in May just before Victoria Day weekend. 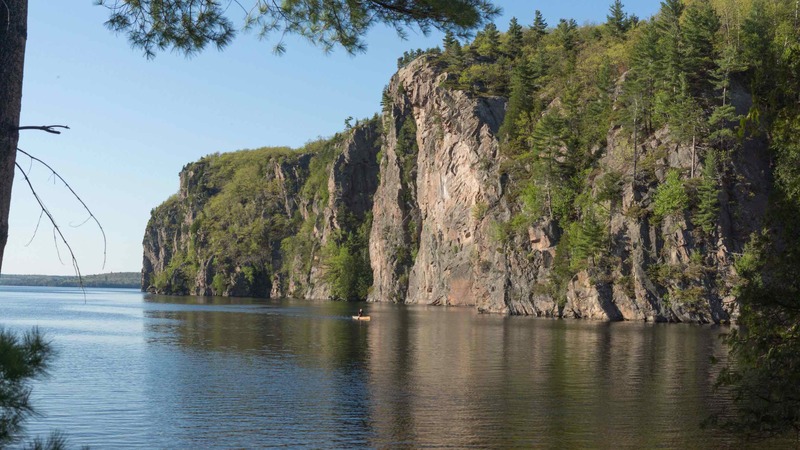 The Lake and the Rock are a part of Bon Echo Provincial Park and as the map above illustrates, when its four hundred campsites are full – common during prime time summer – it becomes a small town! While we were there we saw two other tents and a camper van. The emptiness definitely added to our appreciation of the lake and the Rock! 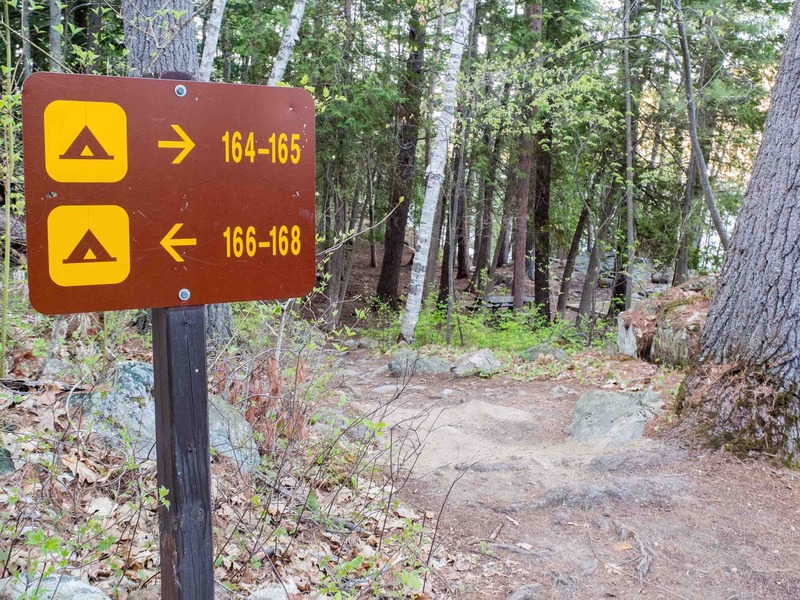 I had booked our campsite online in March; Billed as a “premium” walk-in site, it requires a two hundred meter carry from the parking lot. On the park map above you will find it at the extreme top left – site #168. I still recall when the total cost for two nights at the site popped up on my computer screen – $99.71. I almost scrapped the idea of visiting right then and there – $100. for 2 nights at a park tent site? Well, thankfully I got over it. 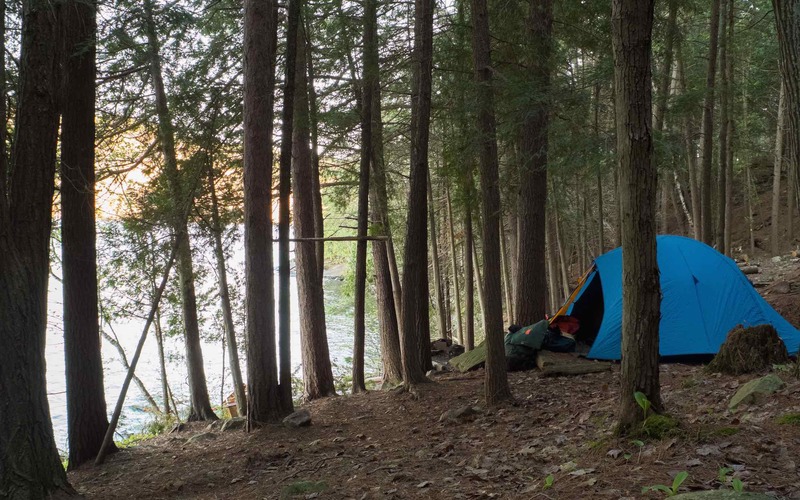 While nothing beats our usual camping on Crown land for free, in this case sitting right across from Mazinaw Rock had an added value that made the fee seem more reasonable. We arrived there early Wednesday evening and left a couple of mornings later. 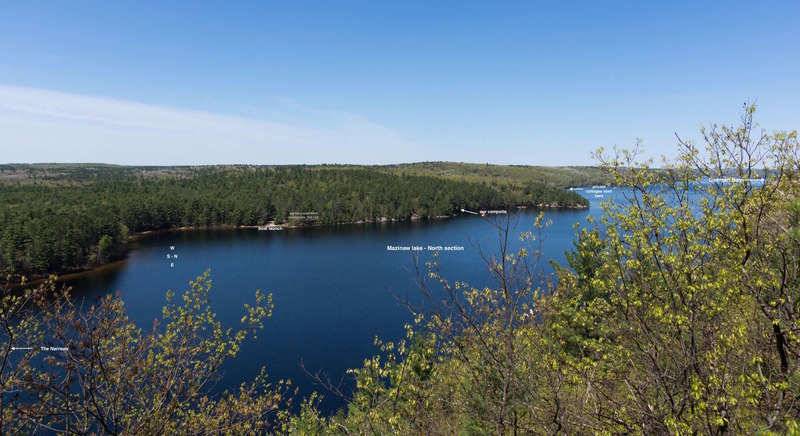 While the two nights were a bit coolish, we had clear sunny weather during the day and saw Mazinaw Rock – it faces westward – change colour from the dark grey of early morning to a lighter grey in late morning to an almost reddish glow in the late afternoon. It was magical. 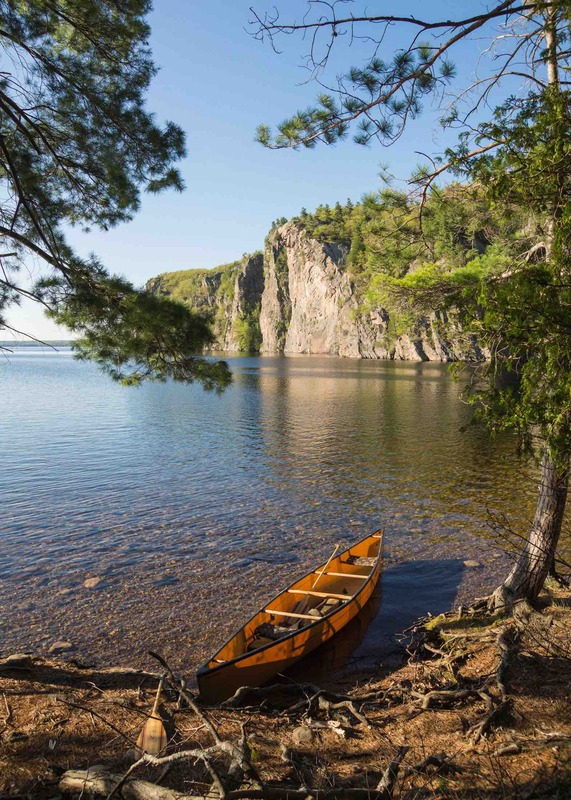 During our time there we paddled the entire length of the rock face twice – once in the morning and again in the late afternoon. Before we left the next morning we went over a third time and redid a good stretch of it. What a great way to spend time! 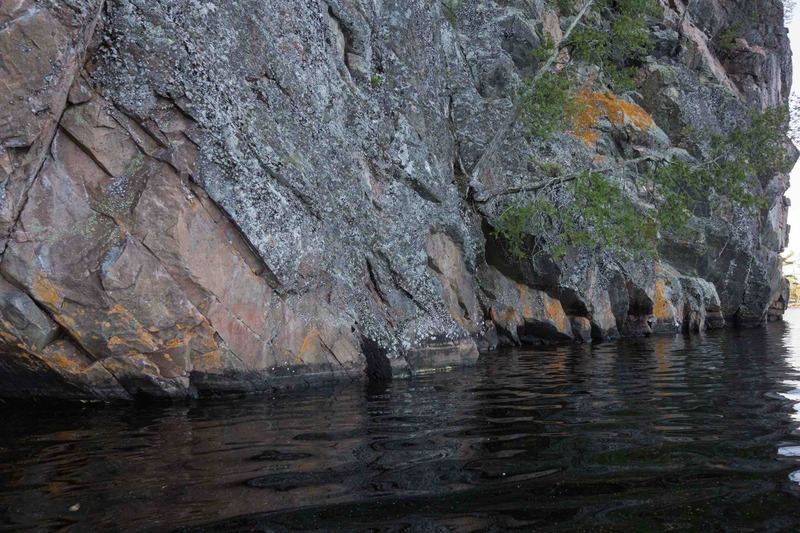 None of our pix captured the feeling of sitting there in our canoe and looking up eighty meters of the vertical rock face. Now that I think of it, using the camera’s video option would perhaps have been the way to show some of the sheer grandeur of Mazinaw. 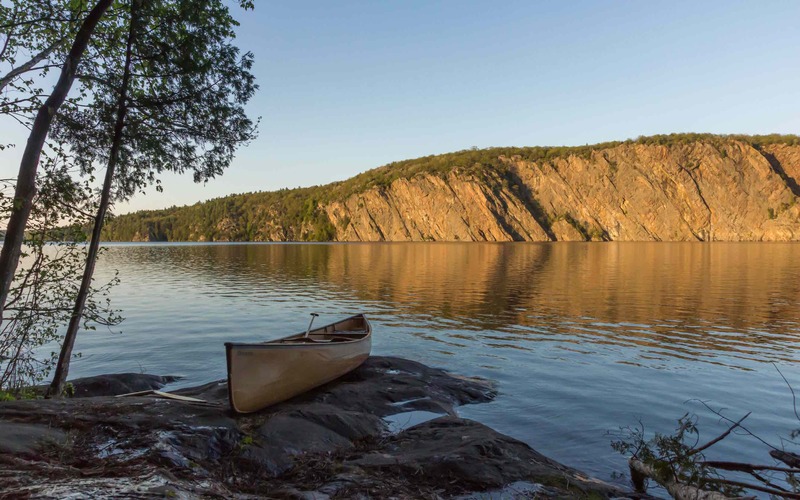 We set off the next morning before breakfast for a ninety-minute paddle down the two-kilometer length of Mazinaw Rock from the south tip of German Bay to the Narrows. As we had done on other pictograph site visits, we enlisted Selwyn Dewdney as our guide. 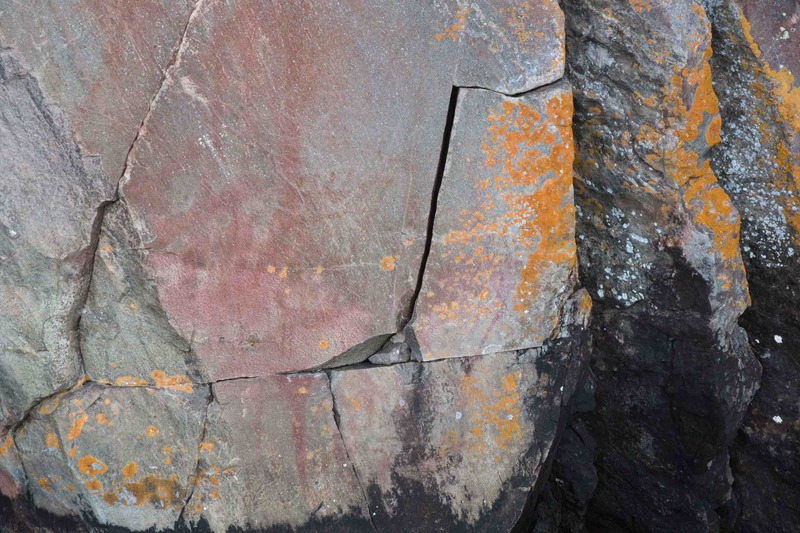 He is the one who initiated the systematic recording and analysis of Canadian Shield pictographs in the late 1950’s and provided us with explanations of sometimes puzzling ochre marks and images. 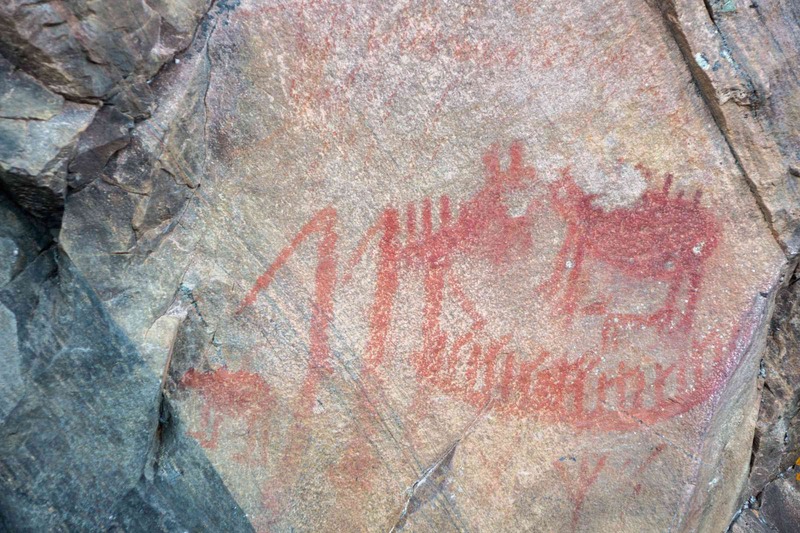 Dewdney, of course, was not the first to note the existence of the pictographs. 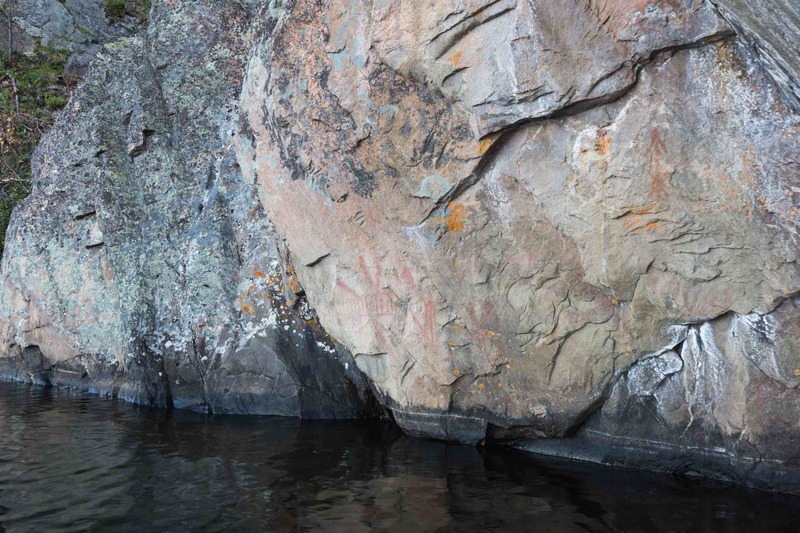 In The Mazinaw Experience: Bon Echo and Beyond (see the end of the post for a link to the book), John Campbell lists references to the rock paintings that go back to 1848, when J.S. Hargen (or Harper according to another source) saw them while surveying the Mississippi River system of which Lake Mazinaw is the headwaters. Also mentioned is an A.J.B. Halfpenny article in the 1879 edition of The Canadian Antiquarian and Numismatic Journal and reports from the 1880’s by both the Smithsonian Institute and Canada’s Federal Department of Indian Affairs. In the early 1890’s the site was also visited and systematically recorded by David Boyle, Canada’s pre-eminent archaeologist of the day and the director of the Ontario Provincial Museum (which would later become the Royal Ontario Museum). Given that many had already noted the existence of the rock paintings, his initial skepticism was unwarranted. 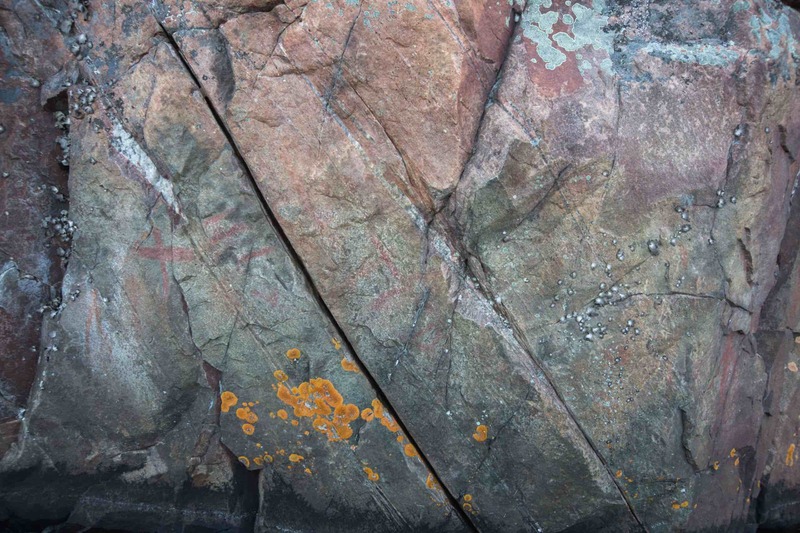 Take a look here at my photos of the pictographs from the Bloodvein River’s Artery Lake site and you will see what Dewdney is getting at when he contrasts the Mazinaw’s pictograph style to the naturalistic portrayal of humans and animals more common further west. 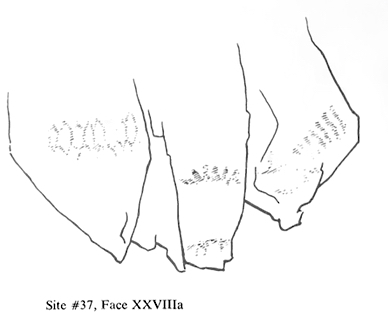 The weird central figure is surely no native animal, although the shoulder-neck area is too badly weathered for the viewer to be able to make out the original outline.The strong suggestion of cloven hoofs is unique. Note the same animal below this one’s belly – not identifiable either, but far more typical of the other animals on the site. Even the canoe, if we so interpret the lower part of the painting, is strikingly different from others elsewhere. As a comparison, here is how David Boyle saw the same panel in his 1892 visit. His ordering system goes from south to north so by the time he got to this face he was up to #37. 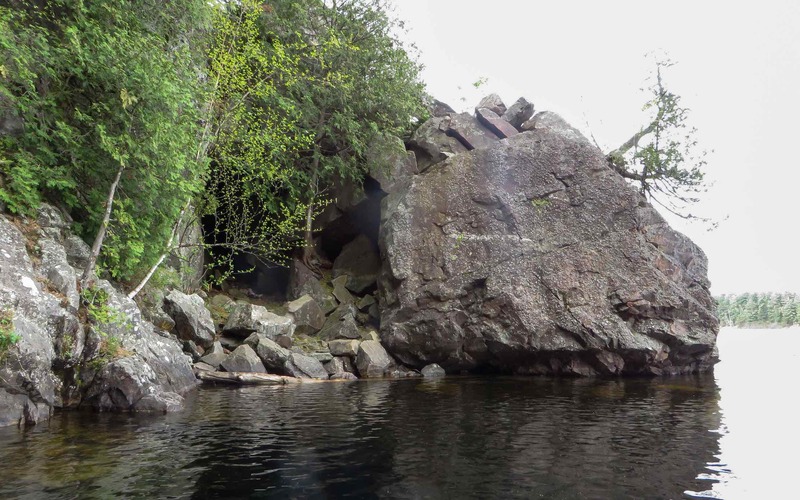 Just underneath and to the south of Face II is what could be interpreted in the Ojibwa worldview as a water level cave entrance for the maymaygweshi, the very creatures that the shaman would come to meet. (See the above face overview photo for the exact location.) 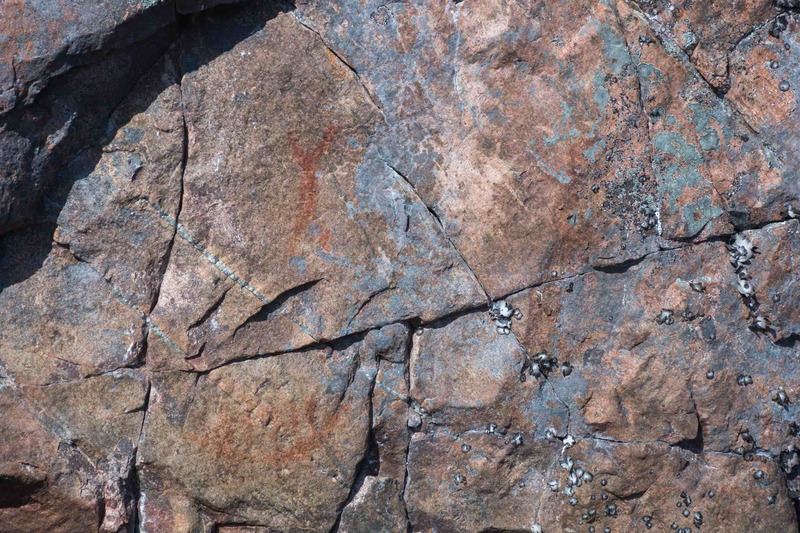 Next to the rock indent are the pictographs seen in the image below, more cryptic and indecipherable lines, including three sets of vertical parallel ones. 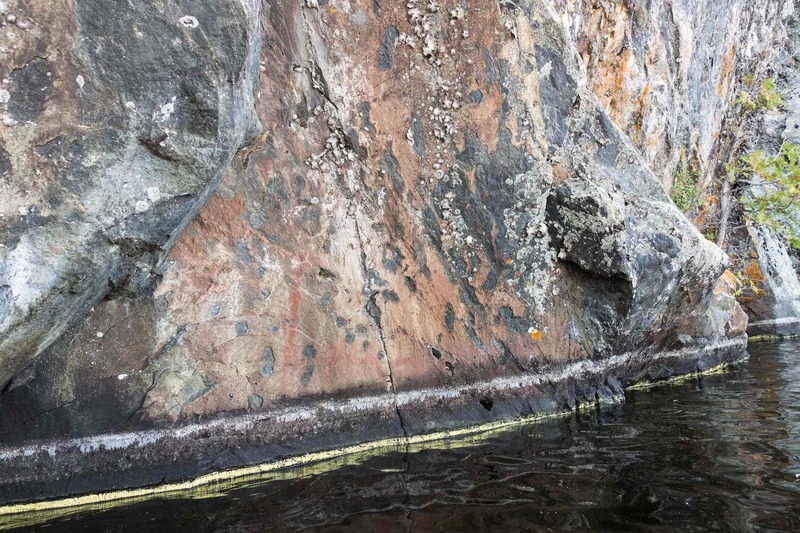 We paddled on, seeing single ochre marks in a couple of places. 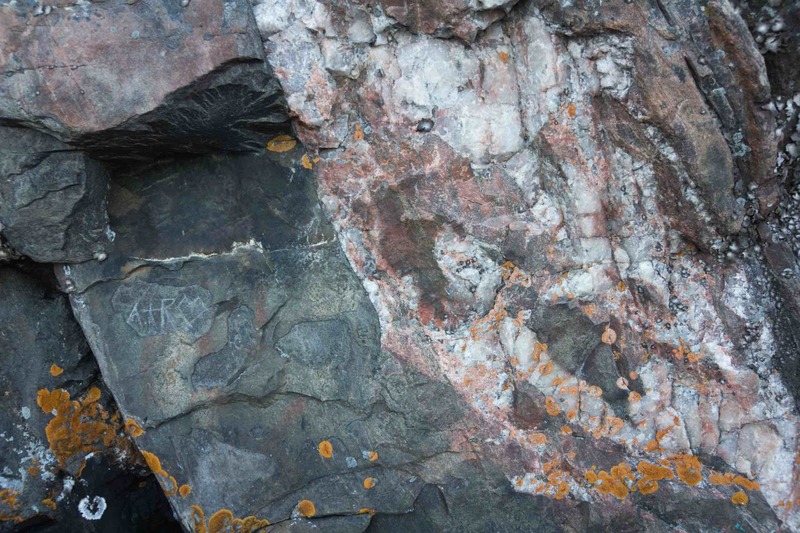 We also saw the first evidence of graffiti – someone’s initials scratched onto the rock face. Admittedly, given that for over a hundred years or more that the lake has hosted increasing numbers of vacationers, things could be a lot worse. 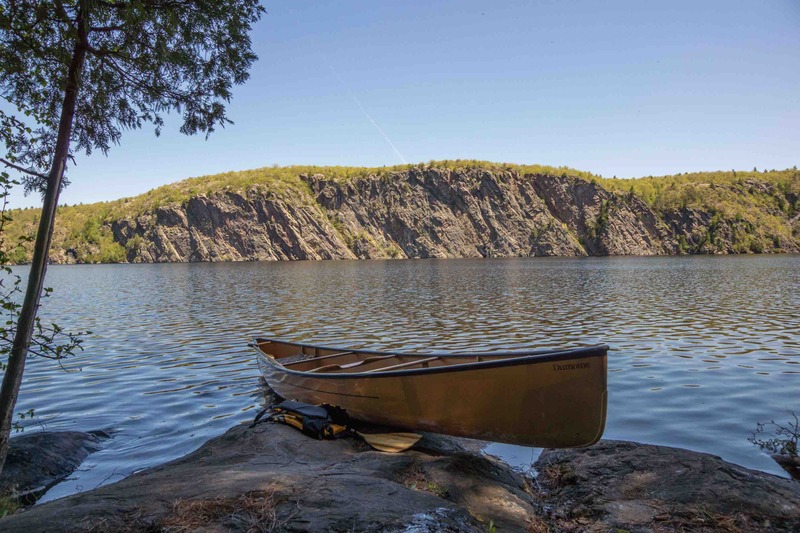 First with the Bon Echo Inn and its satellite cabins and now with Bon Echo Park and its four hundred campsites, 99.5% of visitors have been able to look at, appreciate and just paddle on. When I quickly reviewed our photos after the trip I was initially puzzled by the one below. 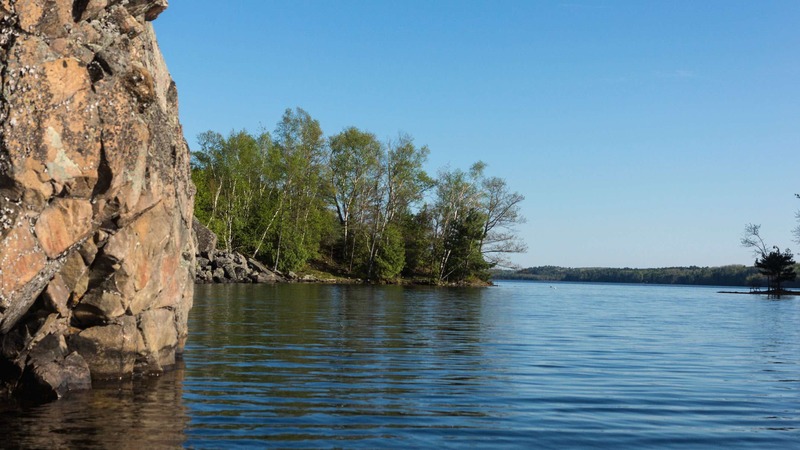 And then I noticed the two rock screws permanently embedded in Mazinaw and I remembered that the Alpine Club of Canada (the Toronto chapter to which I used to belong), has a hut around the corner in German Bay and its members often do climbs on Mazinaw Rock. The first recorded climb was in 1956. 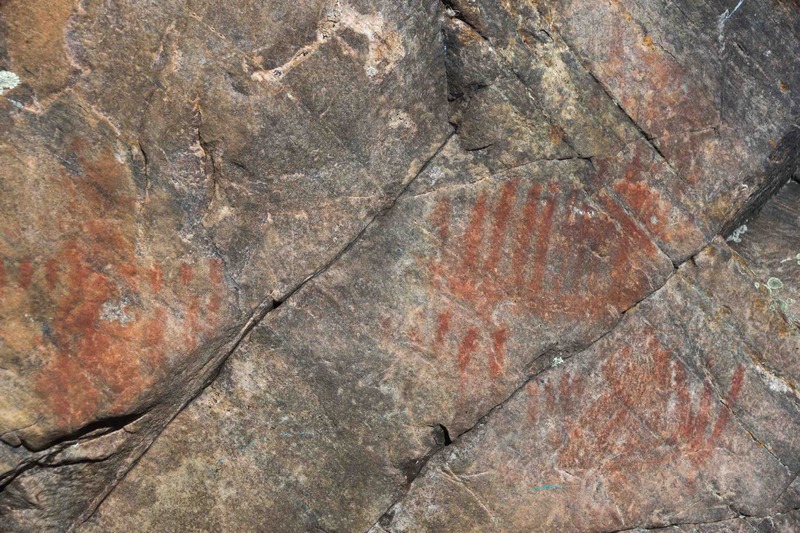 Now I am curious about where the various routes are located and what impact they have had on the pictographs! 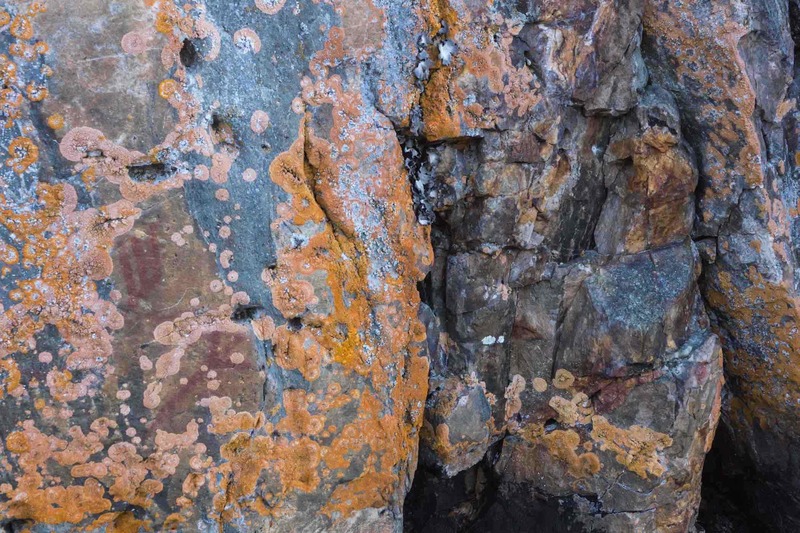 I took a photo of the rock face below because of what initially seemed to us like intentional scouring of the ochre. You can see the two lighter-coloured areas. Given that it makes no sense at all, there must be a better explanation! 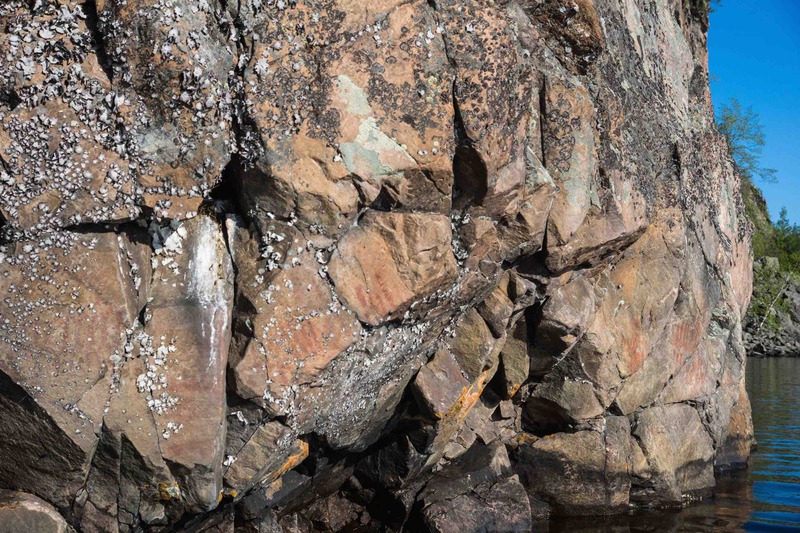 Perhaps it is the result of shoes slipping on the rock as climbers try to get traction at the start of their climb? It is a human trait to find meaning everywhere – even where it usually isn’t! We’re able to turn random events into parts of an engaging narrative! 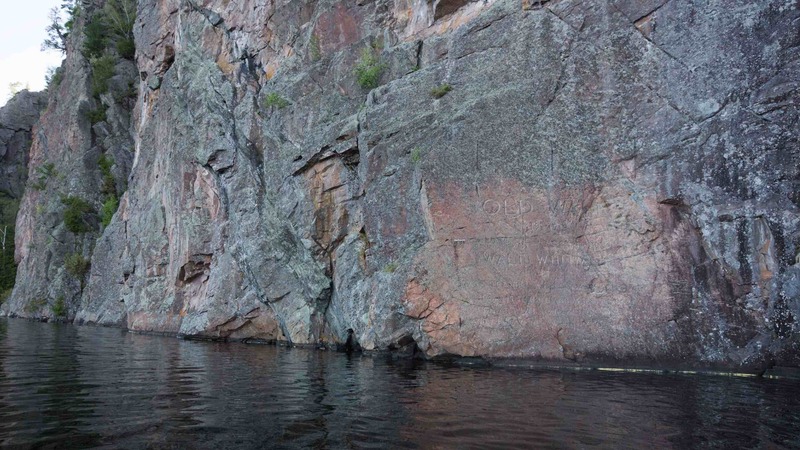 Looking at the rock face above had me thinking about another one 1500 miles away on the Musclow River in Northwestern Ontario. 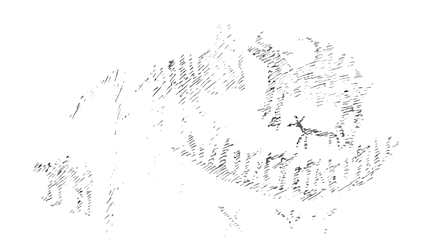 Dewdney did a sketch of a moose there that bears some similarity to the one on this Mazinaw rock face. 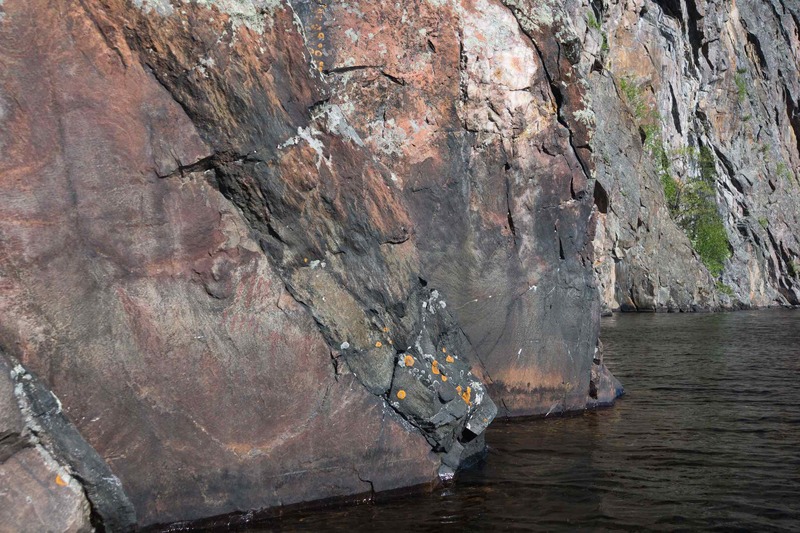 As we headed south to the next major face, the one with “Rabbit man”, we passed this rock face which Dewdney had stopped to sketch and which he labelled Face VII. 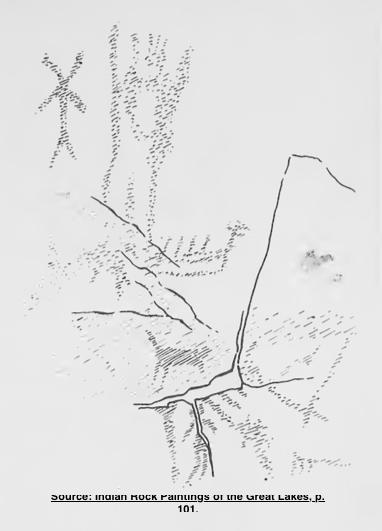 Three human-like figures and some vertical slashes above them is what the sketch and the image below show. Are other rabbit ears emerging from the “tectiform” to the left? 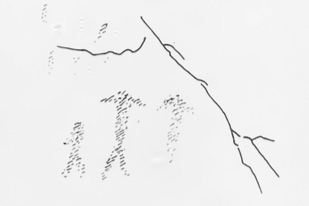 This strangely structured form, unique to the Mazinaw site, appears again on two other faces. Stumped by the word “tectiform”? I was. The online dictionary defines it as “a design found in Paleolithic cave art and believed to represent a structure or dwelling”. It certainly suits better than what I first imagined – a chorus line of thirteen penguins! 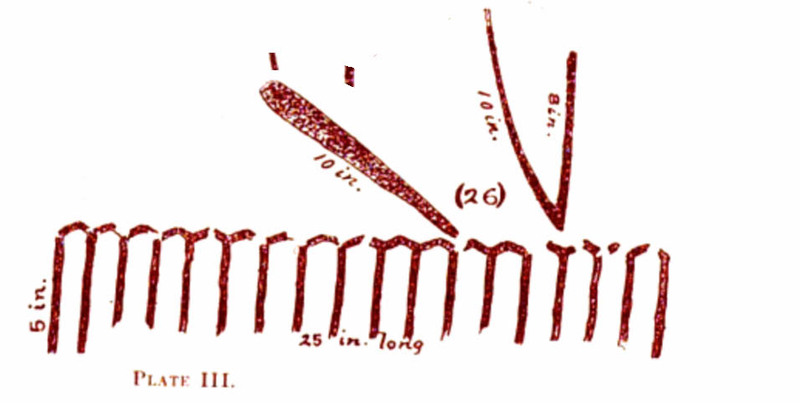 Again as a point of comparison, here are the sketches as they appear in Boyle’s report from the 1890’s – I am again struck by how straight Boyle made everything. He certainly seemed to be lacking the artist’s sensibility that Dewdney had in spades. It is also a reflection of the era each lived in – the rather starchy Victorian Era versus the free-wheelin’ 1960’s. I am a bit confused here by Boyle’s numbering system. #26 and #34 are right next to each other and yet not numbered that way. 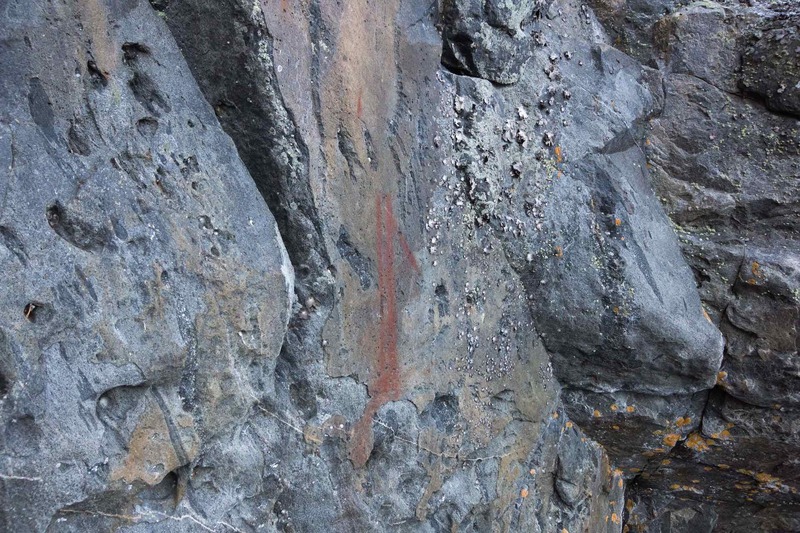 Also, since the pictographs sketched below are closer to #37 – the “Mishupeshu” pictograph panel – you’d think that their number would higher than the “Nanabush” pictograph on the right. 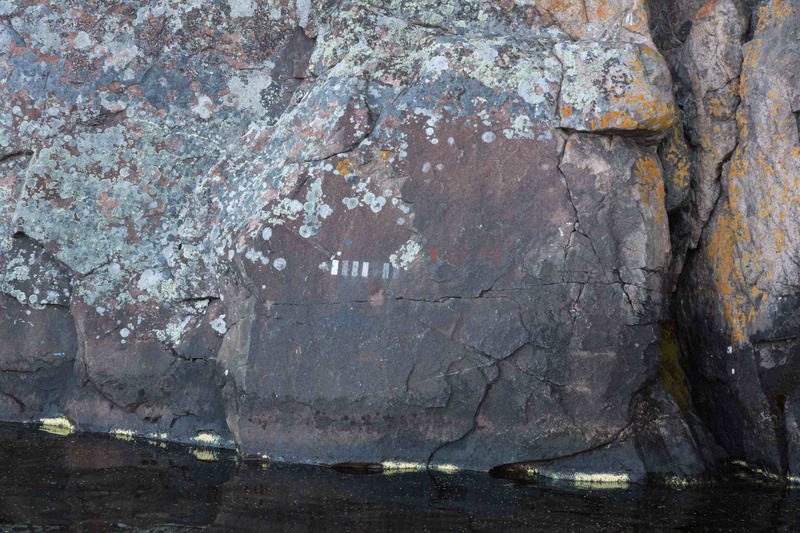 She does go on to note that a birch bark scroll found in northwestern Ontario at Burntside Lake has similar designs. However, her comment about the site as the possible expression of “someone’s deeply personal dream” is perplexing. 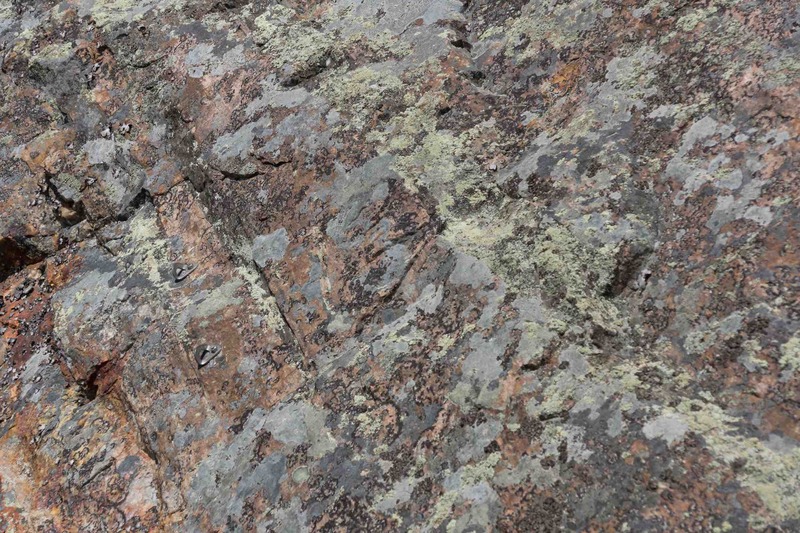 She would have to be referring to this particular rock face and not the entire site. She would know from her extensive work at other sites that Mazinaw is not one person’s work. 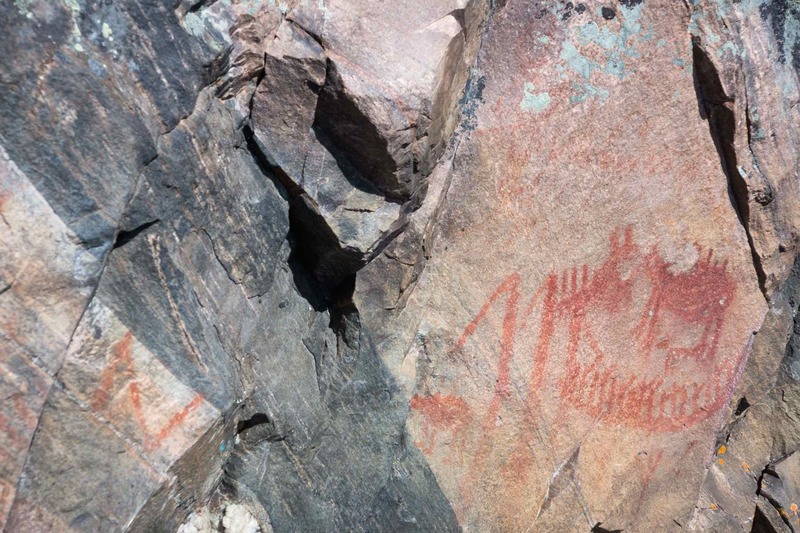 Many “painters” came to this special place over an extended period to create the sheer quantity of pictographs which are still evident today. 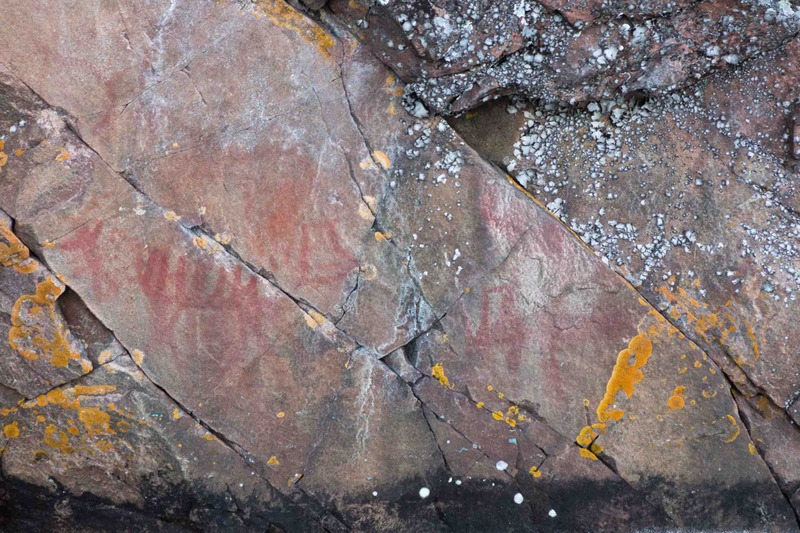 Also, as personal as these ochre paintings may be, the fact remains that those who came here were members of the same culture and shared a common mythological image bank and purpose. To emphasize the “deeply personal” misses the point. 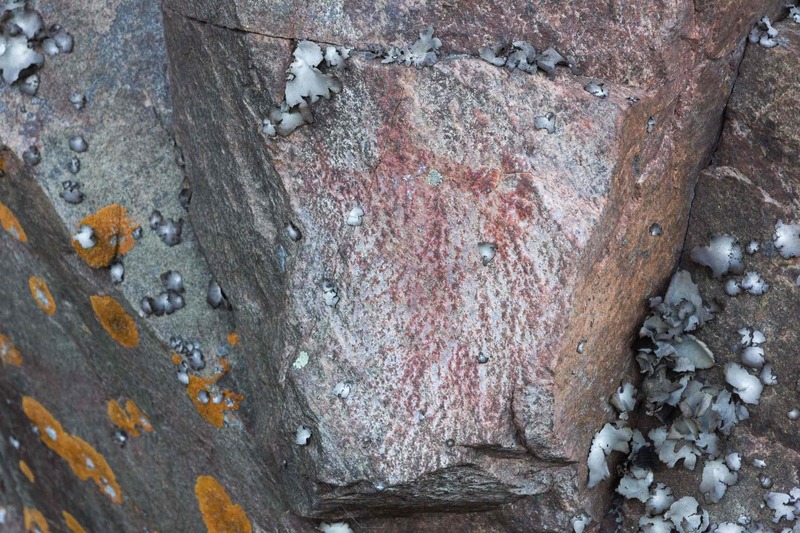 A few meters further on we saw this pictograph which reminded us of similar ones on the Bloodvein – there we saw a couple of versions of a standing human figure holding something in his outstretched arm. We looked at this one and wondered if this too could be interpreted as a shaman holding out his otter skin medicine bag? 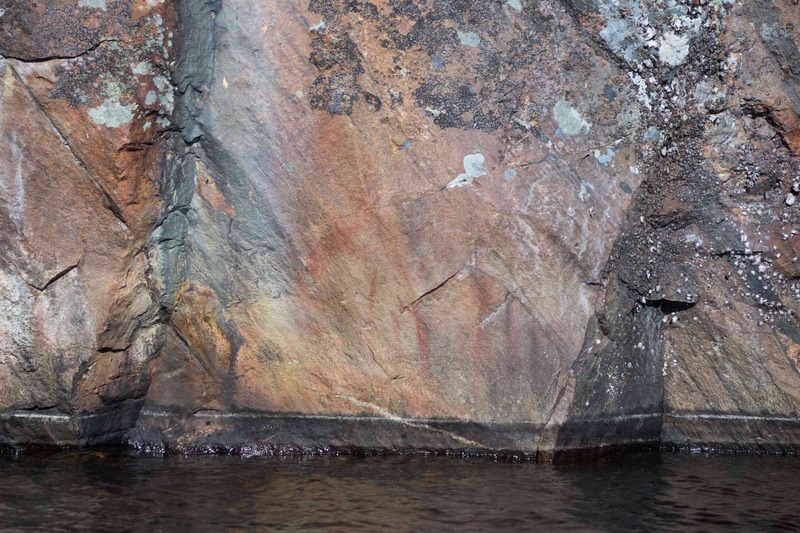 As you paddle south you will pass by dozens more pictographs, some in better shape than others. Eventually, you approach the Narrows. But first, a feature that looks like a cave comes up. 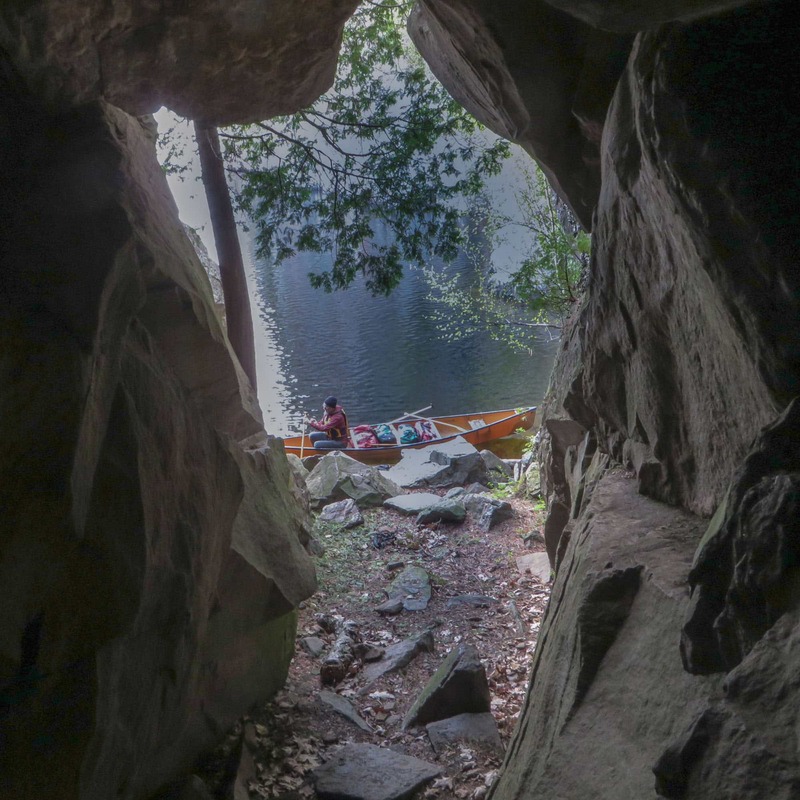 Max hopped out of the canoe to see if there were any pictographs on the inner walls of the “cave” – the answer was “No”. We didn’t know it yet but Max had just walked inside the belly of the Turtle! As we paddled around the corner, there was the Turtle! In the pic below you can see the Turtle’s head stick out over the water. From another angle, you can almost imagine the front legs. You can see how this spot is just asking for some meaning to be assigned to it! Arthur Lismer was one of the legendary Group of Seven painters who spent time at the Bon Echo Inn in the early 1920’s. He made Turtle Rock the subject of a painting entitled “Sheep’s Nose. 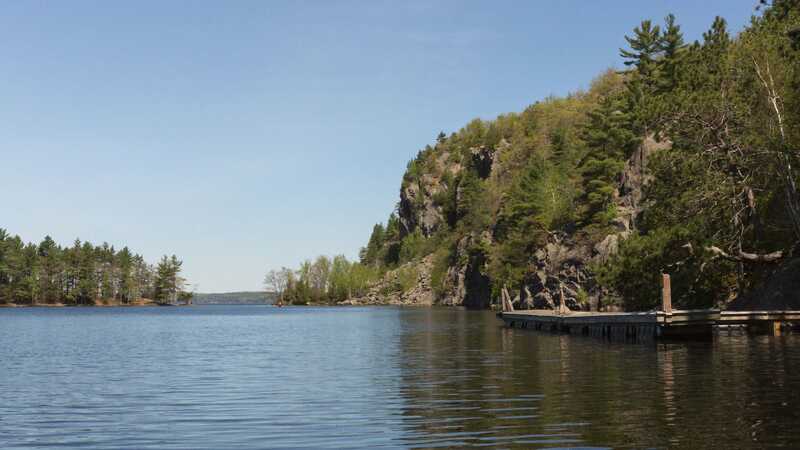 Bon Echo. 1922”. It was purchased in 2010 for $ 1.2 million by the Vancouver Art Gallery and now hangs with the other Lismers in its collection. 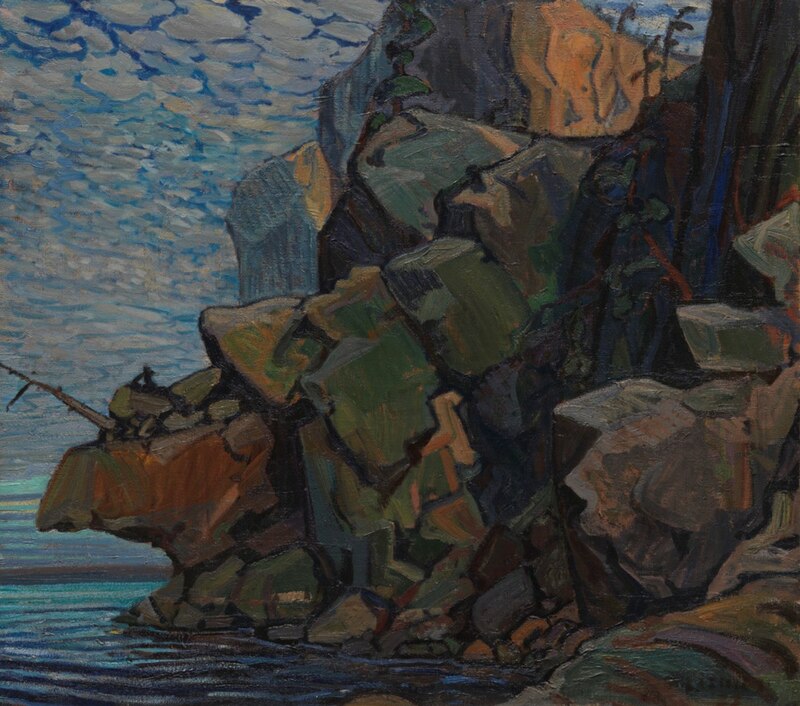 Had I been aware of this painting before we visited Mazinaw Rock I would have made more of an effort to duplicate Lismer’s framing of the scene! 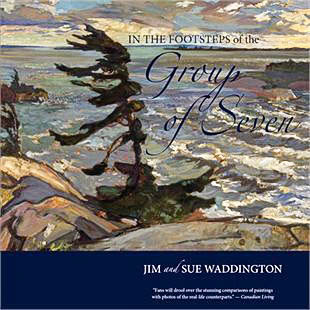 I found it while leafing through my copy of Sue and Jim Waddington’s In The Footsteps of The Group of Seven. 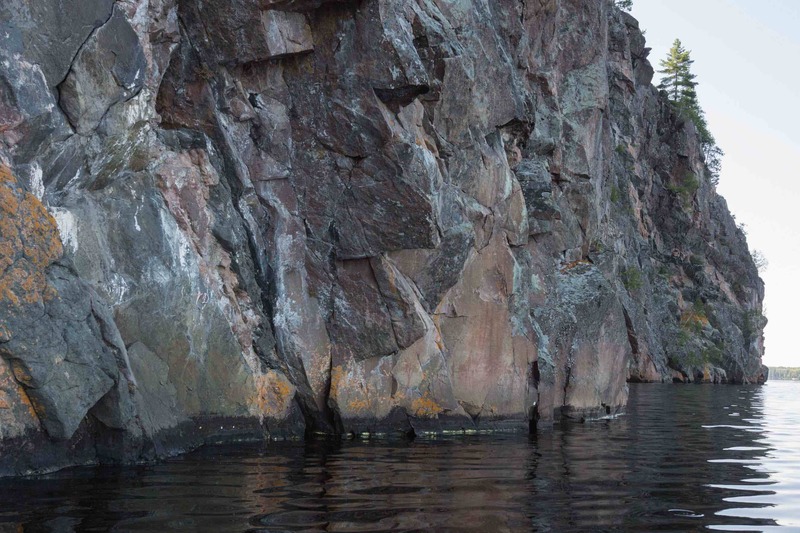 Beyond the Turtle’s nose, we paddled by another indecipherable rock face sketched by Dewdney. The more familiar forms below call for little comment, but those in the bottom margin [of p. 101] are strange indeed. The one might have been influenced by a pottery design; the other might be described as “geometricized tree branches” for lack of a better guess. Next up was this strange collection of small rectangles – different shades of white and ochre-coloured strips. Perhaps an experiment to see how long different paints and ochre formulations last? strips of white and ochre – an experiment in progress? 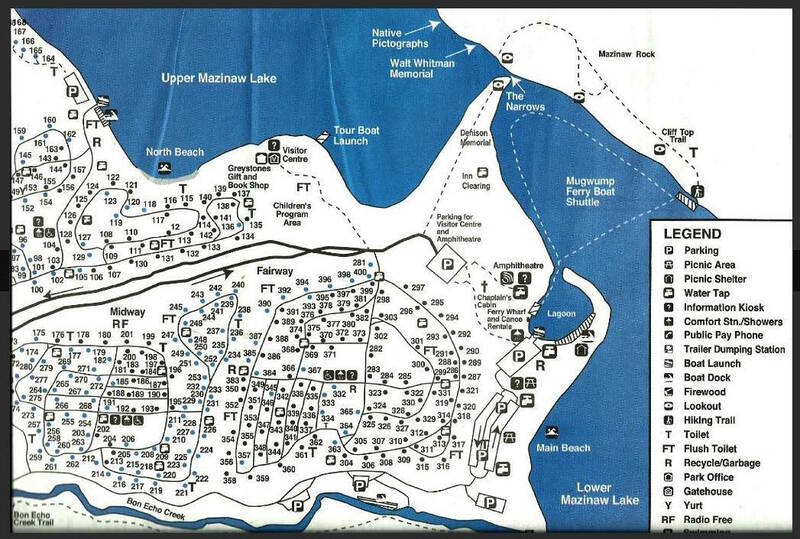 For a thirty-year period from 1900 to 1930 not far from the Narrows was the Bon Echo Inn and its cabins. It included a few members of the famed Group of Seven painters as its clientele; the owner was a Flora MacDonald Denison, a woman with progressive and somewhat unconventional views. A women’s rights campaigner as well as a spiritualist of the Madame Blavatsky sort, she was also smitten by Walt Whitman, the U.S. poet. 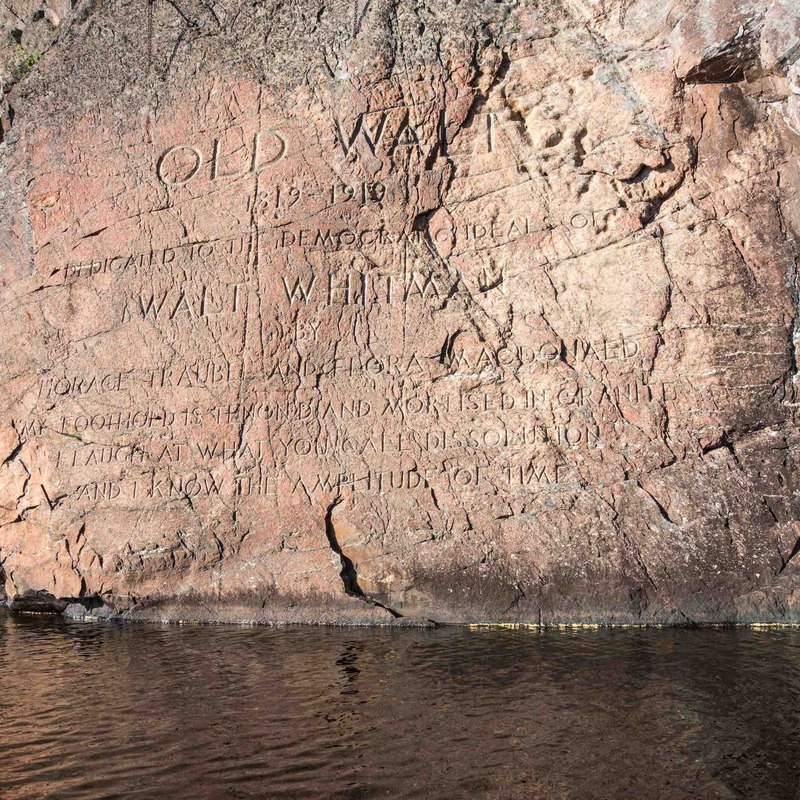 In 1920 she had a memorial to Whitman – entitled “Old Walt” – engraved onto Mazinaw Rock just a bit north of the Narrows. 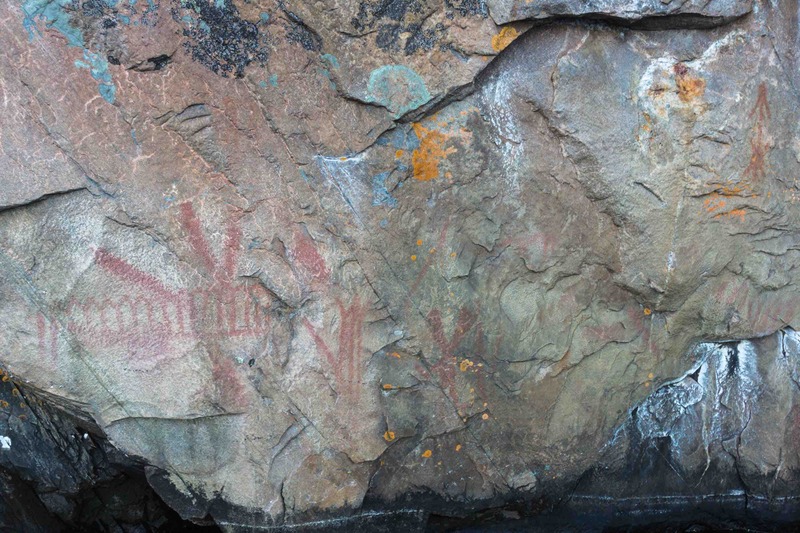 We were surprised to find more pictographs south of the Old Walt engraving and wondered what ochre images had been destroyed in creating the homage to Whitman. 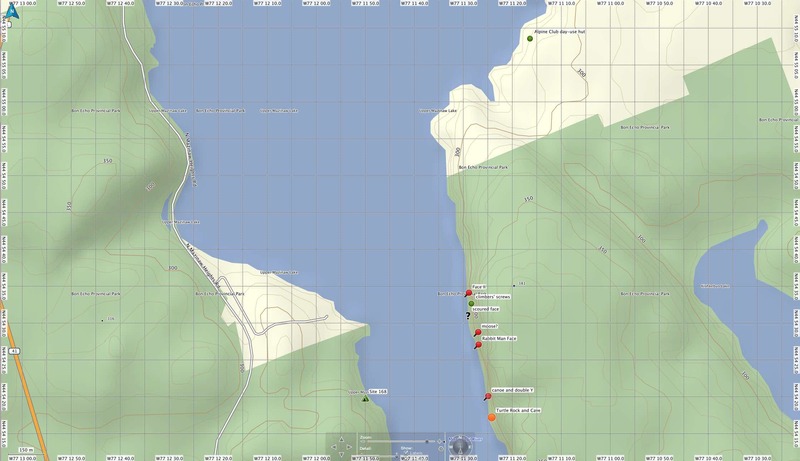 There is one more site north of the Narrows – Face XXVIII. 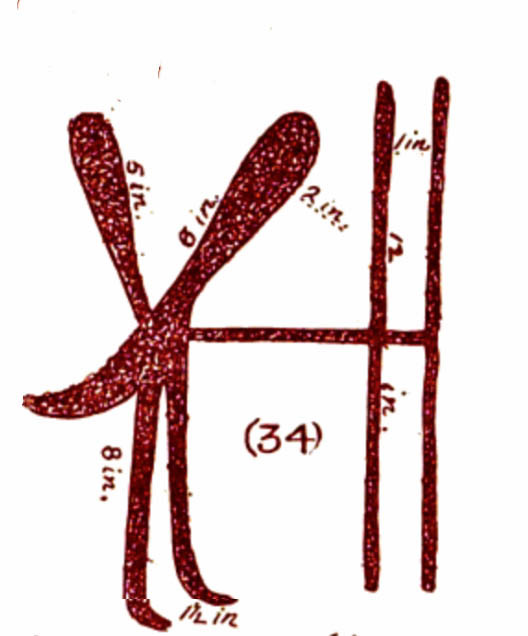 It is divided into a couple of parts, the first of which Dewdney labelled XXVIIIa. Our early morning paddle done, we headed back to our campsite and breakfast. Given that we had entered the park the previous evening after closing time, we also had to go up to the gate and register our vehicle and get our two-day pass. Driving through the park we were surprised to see that there was nobody there. 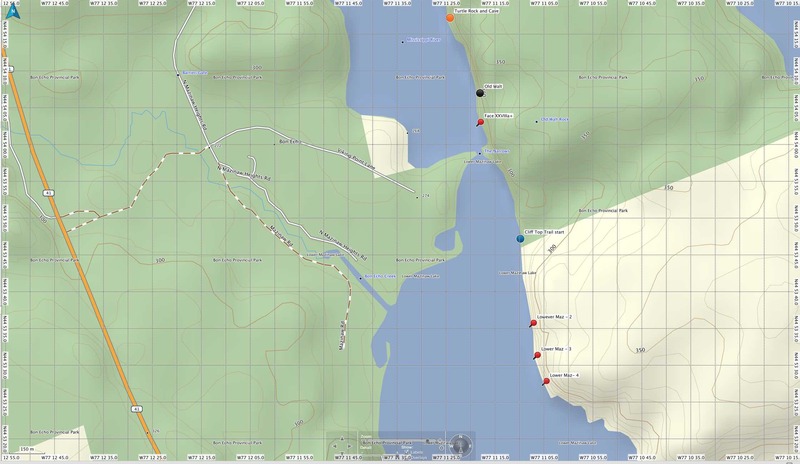 In the afternoon we went back over to the east side of the lake and paddled by all the pictos again. The light and shadows gave the rock face a different and warmer look. 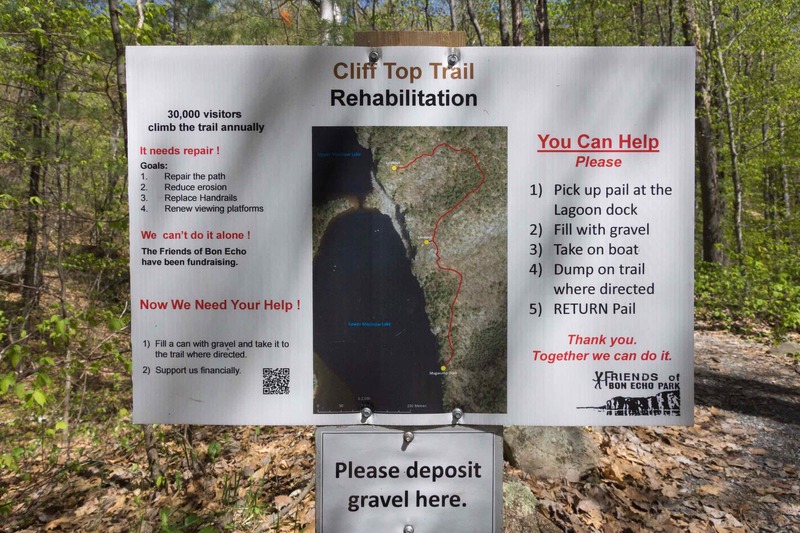 When we got to the dock just beyond the Narrows we parked the canoe and spent an hour walking up to the top of the cliff and enjoying the view from the various viewing platforms developed by Friends of Bon Echo Park. A commendable project and very nicely done! Leaving the dock after our Cliff Top visit, we paddled south to see the three rock faces mentioned by Dewdney on the lower part of the lake. (They make up Site #38 on his list.) While I have ordered them here in the order we would have seen them (north to south), I decided not to take any pix as we paddled down. “I’ll just get them when we come back in a few minutes” was how I put it. 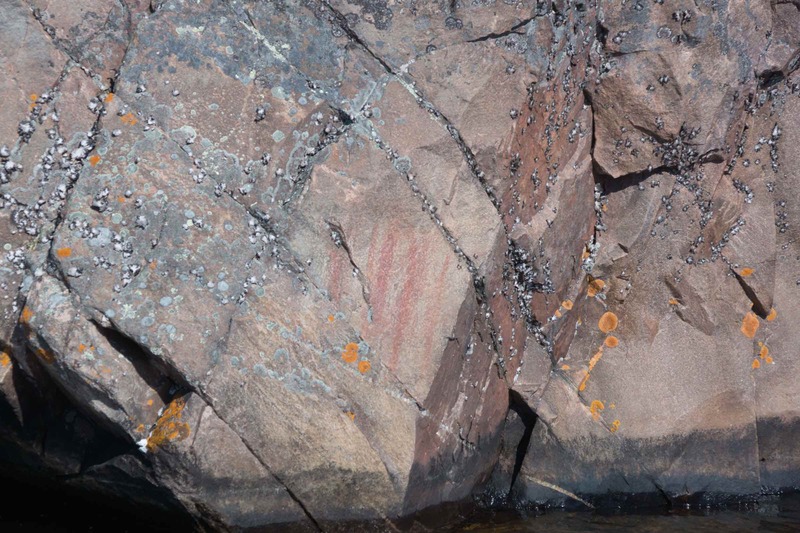 So – we ended up seeing four different rock faces with pictographs as we paddled down but when we came back we could only find three! I am also not sure why none of the three sites we photographed have a face that looks like the Face III sketch on p.102 of Dewdney’s book – unless it is the one we missed on the way back! We paddled back to our campsite and spent some time rambling around the area behind our tent. As sunset came we got to see Mazinaw Rock glow one more time. While it had taken us a while to get there, we recognized our good fortune in being able to glide past the ochre signs still visible just above water level. In the process of listening to the pictographs, we came away with more pieces of a puzzle that seems to get bigger instead of smaller! 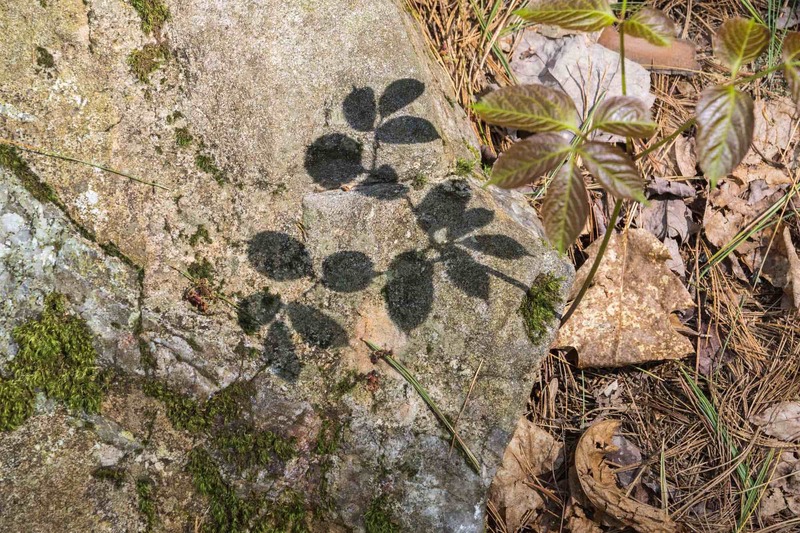 shadow on rock – ephemeral pictograph! 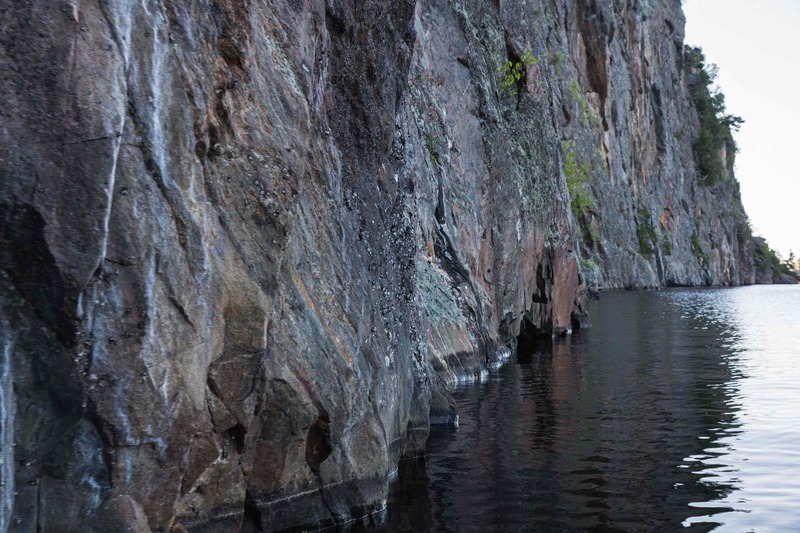 John Campbell’s The Mazinaw Experience: Bon Echo And Beyond provides a great overview of the history of the area. The first two chapters deal with the First Nations period and further chapters cover lumbering, farming settlements, mining, and tourism in the region. Click on the title above to see its Amazon page (available as a Mobi file) or read the introduction and the first two chapters (pp.1-23) at Google Books by clicking here. 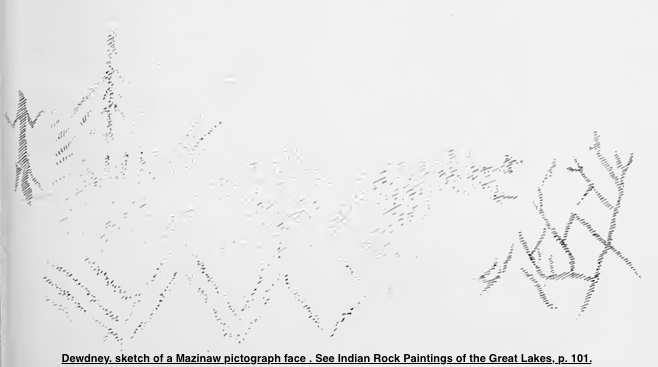 The first edition (1962) of Selwyn Dewdney’s Indian Rock Paintings of the Great Lakes is accessible for online reading or downloadable in various formats thanks to the Royal Ontario Museum. It made the contribution to the Internet Archive in 2014. Just click on the book title to go to the website. Mazinaw is dealt with from pp. 96 to 101. 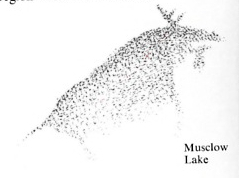 David Boyle’s report Rock Paintings At Lake Massanog can be found online at the Google Books site. The article begins on the bottom of p. 46 and is preceded by three pages of general comments entitled “Rock Paintings or Petrography”. I’ve taken both articles and put them into a 1.4 Mb pdf file which you can download here. 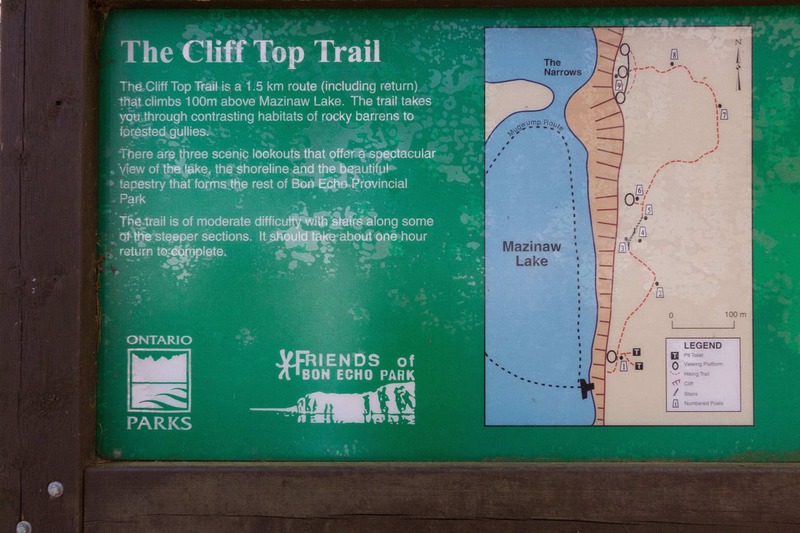 This entry was posted in Pictographs of the Canadian Shield and tagged Bon Echo pictographs, Bon Echo Provincial Park campsites, Bon Echo rock climbing, Bon Echo rock paintings, David Boyle Massanog, massanog rock paintings, Mazinaw cliffs, Mazinaw Mishupeshu, Mazinaw pictograph locations, Selwyn Dewdney Mazinaw. Bookmark the permalink. Fascinating. I was at Bon Echo a couple of years ago in late November and we had the whole snowy place to ourselves. It was beautiful but your photos warm it up and bring it to life. Interesting too to read about the Scottish connection N.
Late November! No wonder you had the place to yourselves! I’d like to see it in mid to late September with the fall colours. I’m happy to have finally visited the lake and the Rock – a special place, especially when there is no one else there! 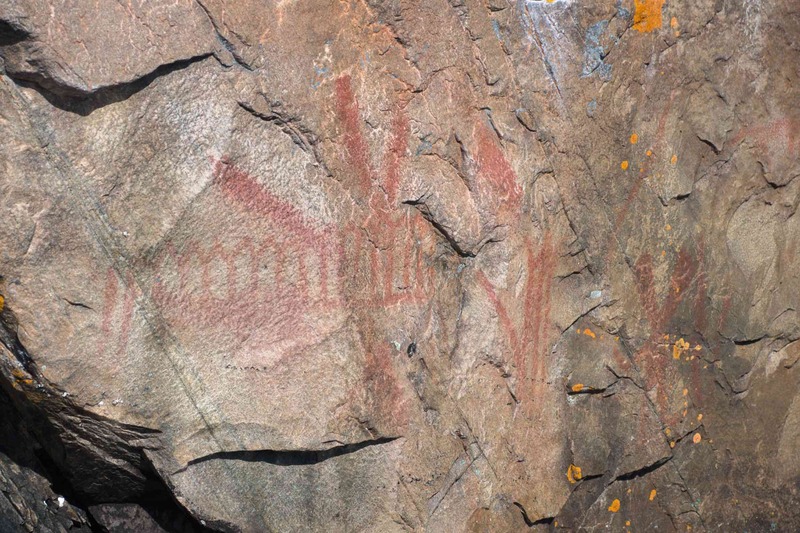 Hi, I work for a company in Montreal that makes educational TV for kids for TVOntario, and I would like to know if we could use some of your photos of the pictographs on Mazinaw rock in an episode of our show “The Mystery Files”. Can I contact you by email about this? Laura, feel free to make use of any of our images that will help you tell your story. Email me at true_north@mac.com to discuss anything further! 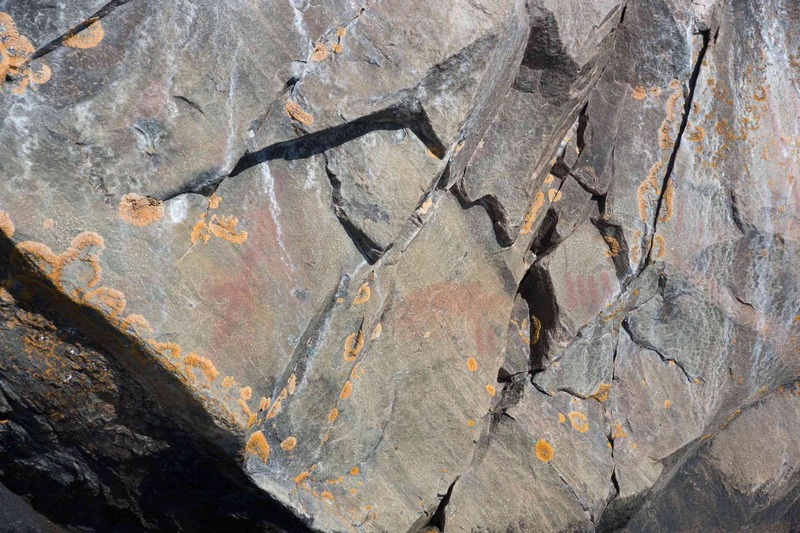 Excellent write up… I’m interested in doing my undergrad dissertation on rock art in southern Ontario. 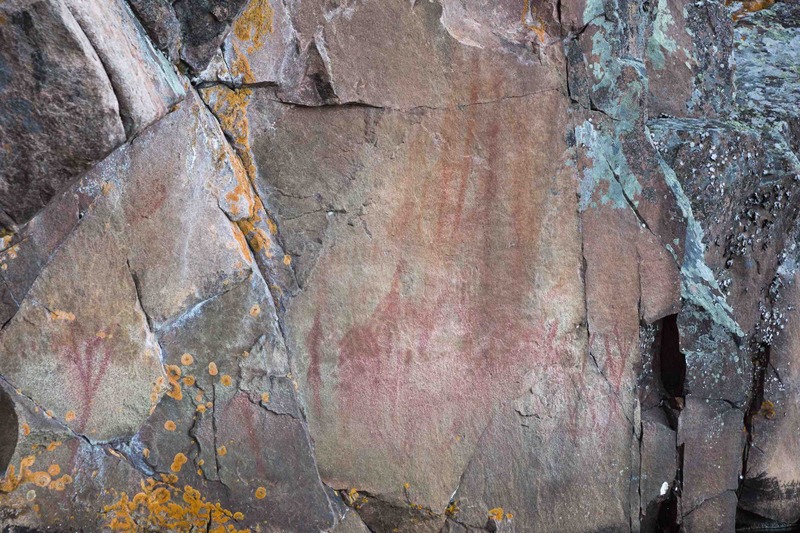 Kevin, I am always heartened to hear that the interest in the indigenous rock art found in our province is still alive! Your research will provide you with an entry into the Anishinaabe culture of the Algonquin people whose homeland the Ottawa River basin is. 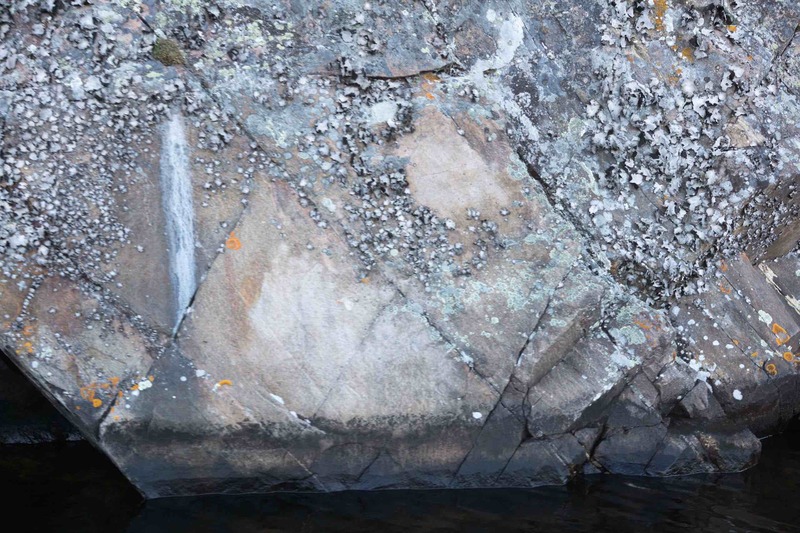 Oiseau Rock on the Ottawa River, the petroglyphs at Petroglyph Park, the fading pictographs at Oiseau Rock – they will be your main areas of study. 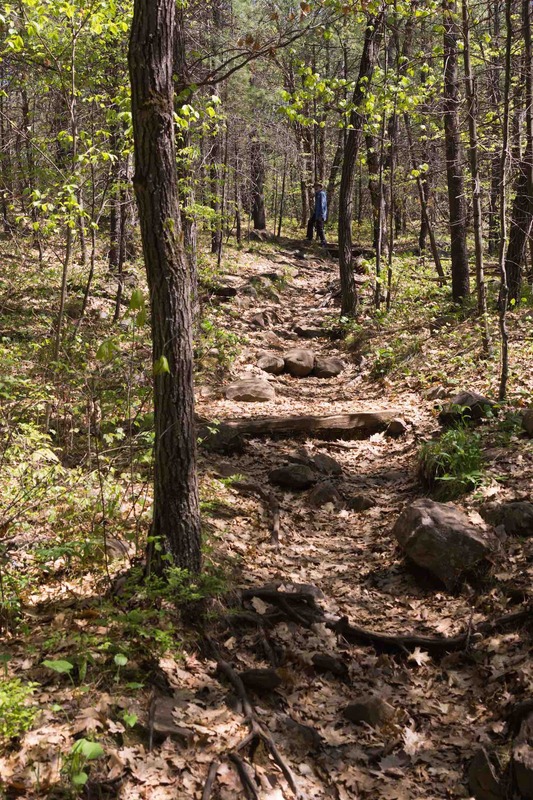 Unfortunately, there are not many other sites that can be mentioned for southern Ontario – i.e. 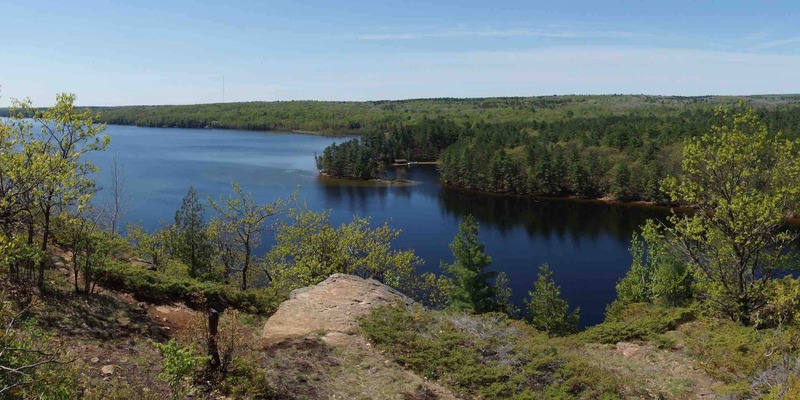 Ontario south of the French River and Lake Nipissing. 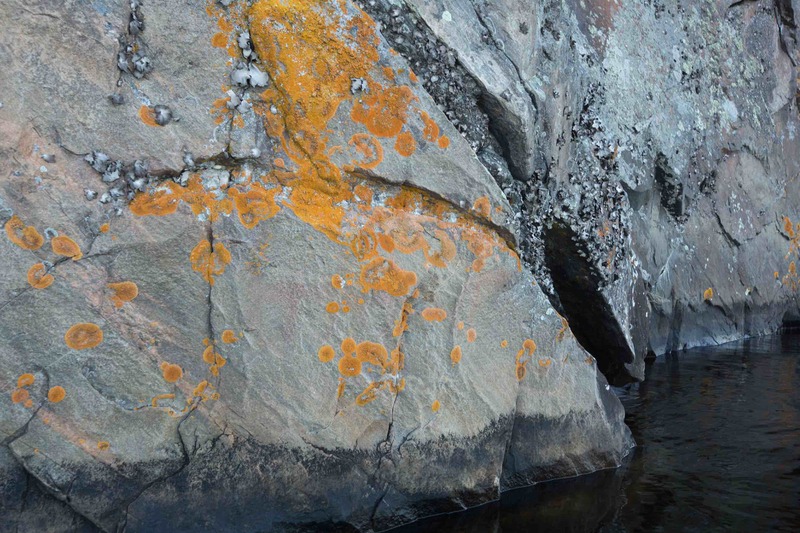 It is not as rich a source of rock art sites as, for example, northwestern Ontario. But I guess it all depends on what you plan on doing with it in your dissertation. Good luck with your research. 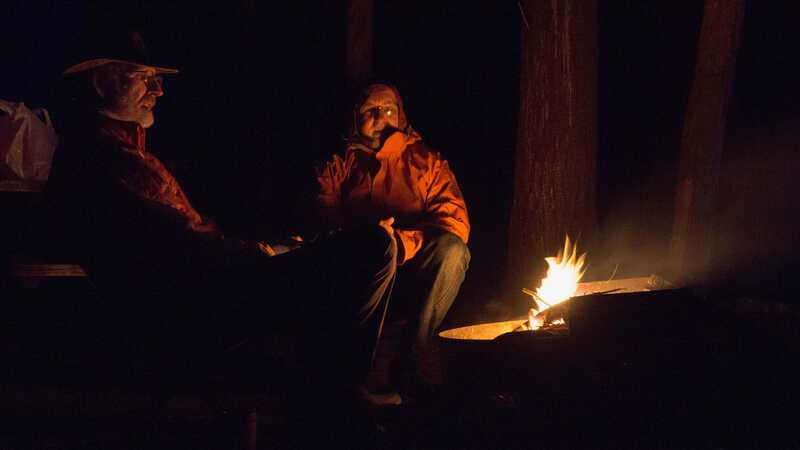 Even better if it gets you into a canoe and off the grid for a while! P.S. Get in touch if you need any help or information! I may be able to pont you in the right direction.